The fruit of the cacao tree goes through six steps to become chocolate. You can control only a few of these steps, so you must work with your fellow chocolate makers to keep the chocolate flowing through the production chain. It sounds cooperative and friendly — but did we mention that the chocolate maker with the most money wins? Things always get complicated when money is involved. To ensure your portion of the production process is used the most so that it earns you cash, occasionally you'll help your customers and suppliers. At the same time, you will attempt to crush your competitors, force others to help you, and manipulate the supply chain. You'll do whatever it takes to become the king of chocolate. KING CHOCOLATE Mayfair Games 2-5 players aged 10+ designed by Stefan Alexander Components: 5 Player Screens; 90 Money Tokens; 20 Workers; 42 Production Tiles (double-hex); 85 Wooden Cubes (Cacao); 15 Starting Tiles; 1 Starting Ring Amongst the board games players I have spoken with there is a debate going on about KING CHOCOLATE and it has nothing to do with the game itself; there are two sides in conflict about the box art. In one corner (where I admit I sit) there are those who believe this is possibly the worst ever box design. It has no eye appeal, it brings nothing to the table about the game and is bland and boring. In the other corner the argument is that it is the most contemporary and arty board game cover that bravely defies the usual colourful animated illustrations in favour of looking like an expensively regal box of chocolates. KING CHOCOLATE is one of the newer breed of semi-cooperative games. You have to cooperate with the other players throughout the game but you also have to do what you can to ensure that when the game comes to its conclusion you are the player with the most money, so being nice isn't always the way to the top, but being devious could well be. The game is quite unique in the fact that it is a tile laying game where the tiles are all double-hexes which makes playing them more of a challenge, and also a lot of fun in the process. This is a tile-laying, worker placement, game about the productive growth of Cacao through its six stages of development towards becoming Chocolate. To help it on its way the players lay tiles representing the six steps and place workers in the best positions to collect the most cash, spending just 3 Action Points (APs) per turn. Players keep a hand of tiles behind their personal screens; at first these include specific start tiles, and each turn they must play one of these onto the table ensuring it is adjacent to previously placed tiles or the side of the Starting Ring. It is often a good idea to play a tile that matches one of the ends by colour of a previously laid tile but tiles do not have to match. Laying same colour tiles against each other creates Groups and it is on unoccupied Groups that you place your workers, one only per Group. The tiles are not only different coloured at each end (basically each tile is two hexes), recreating by the darkening of each numbered hex, the darkening of the Pod on its way to becoming Chocolate. They also show circles and a number in Roman style singular numerals; these are the six stages of Chocolate production: Pods, Beans, Roast, Nibs, Liquor and finally Chocolate. Placing workers costs 2 APs whereas Production, Worker placement or movement and Drawing tiles (to ensure you have tiles to place each round) cost 1 AP each and as already noted players have just 3APs per round to spend. Cacao cubes (the brown wooden blocks) are placed onto the circles beginning on the Yellow (Pod) circles and being moved progressively through the stages of the production chain; the placing and moving of Cacao cubes is available as an Action in the Production phase. Once cubes pass the 5th stage they are returned to general supply. Players with a worker on a Group control that Group and they can gain cash when other players move through their controlled areas. Players also gain $dollars when Cacao cubes move off of a controlled Group. Moving Cacao cubes off of an occupied/controlled Group is the way to make money. KING CHOCOLATE is all about getting other players to do the majority of the work for you so you can reap the benefits. This doesn't work so well (or at all) when playing a two-player game where you are almost grovelling for every $1. KING CHOCOLATE may be a tile placing, worker placement game but it is quite different from any of the other games of this genre. I have said that I am not keen on the box art (personal opinion) but I have also said on many occasions that you play the game not the box. 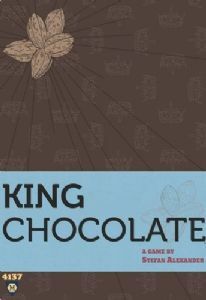 In the case of KING CHOCOLATE I looked past the cover art and discovered a very clever game that requires thoughtful strategy. The tiles can be played inside or outside of the Starting Circle giving players several options if they select the Place A Tile action. The mechanics of the game, just 3 Actions, and the rules, basically all you need to know is on the reverse of each Player's Personal Screen, have taken ideas from other games in this genre and compressed them into an understandable game that you can easily introduce new players, even non-gamers and youngsters, to. It isn't a heavy game though it is, as I have said, a strategy game, which plays within an hour but has all the looks and components of a much more complex and complicated game, it being neither complex nor complicated. If you can you should try to control the largest Groups (created as I said by placing same colour hexes adjacent to each other) possible as it is generally easier to move the Cacao through these, particularly if you have a good diversity of different hexes within said Group. You can move the cubes through opponent occupied Groups but that gains cash for that opponent; seeing as you need to have the most money to win, giving money to an opponent is rarely a good idea. KING CHOCOLATE is quite different from the type of game usually associated with Mayfair Games, though there catalogue has altered considerably and for the better since melding Lookout Games into their world, in fact I was rather surprised not to find the Lookout Games logo on the box, it's their sort of genre. KING CHOCOLATE is a game where you need to cooperate with the other players but the amount of cooperation you give could determine the amount of cash you end up with, it's all a matter of choice, options and decision making. It also gives you a brief look at Chocolate production and also makes you want to eat more chocolate; hmm! should this game carry a health warning ?